Properly speaking, the line around the “Sea” should have been 31.5 cubits but the ancient Hebrews were very knowledgeable about geometry and measuring techniques were crude. conceivable application of pi would possibly take more than 40 digits. Still, the challenge of calculating pi to the farthest digit possible has been an irresistible one for mathematicians over the years. For all of the nerds out there, including me, today is international Pi Day, the day when we celebrate our favorite mathematical constant. Pi Day is best celebrated by pi memorization contests, walking in circles, and, of course, eating pies, or is it pis? I think I will celebrate by writing a little about pi. This year is a very special Pi Day. The first digits of pi are 3.1415 so this year 3/14/15 is the Pi Day of the century. For all of the nerds out there, including me, today is international Pi Day, the day when we celebrate our favorite mathematical constant. Pi Day is best celebrated by pi memorization contests, walking in circles, and, of course, eating pies, or it is pis. I think I will celebrate by writing a little about pi. Pi or π is, as everyone should know, the ration between a circle’s diameter and its circumference. Pi is an irrational number. By this, they do not mean that pi makes no sense but rather that pi is a constant that cannot be expressed as a ratio of two integers. Numbers like 2 or .445 or 1/2 can be expressed as a ratio of two integers and so are rational. Numbers like pi or the square root of any number that is not a perfect square, the square root of 2 for instance, are irrational. An irrational number expressed in decimal form never ends or repeats but continues to infinity. Thus, there can never be a last digit of pi. I almost forgot, today is Pi Day, the day (3-14) to celebrate the famous mathematical constant π. 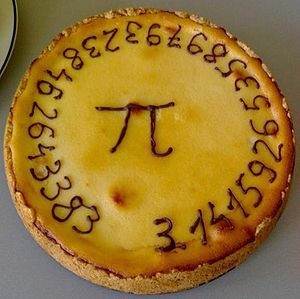 This day should be celebrated by recitation of the digits of pi, 3.1415926….., measuring circles, and eating pies, or pis. Happy Pi Day to all the nerds out there! You can see Pi out to a million digits here.